Growing up on a farm in a small town in Indiana has influenced my outlook of many things in my life. A thought that everything is made to be used for a specific reason has been planted in me. When the time is taken to create something there must be a purpose for that object, and a set process to make it correctly. An important process that can be the purpose I need all by itself. These ideals drive my motivation for creation. 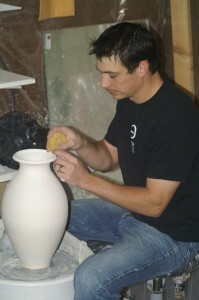 I’ve been working with clay for a little over twelve years. I got started by taking a college elective class at University of Southern Indiana. This is where I first learned about the process of crystalline. I then researched and tested the process until I got the results that I was content with. The crystalline glazing process is a constant learning process and I will always be researching new glazes and techniques to use. This constant learning process led me to receive my BS in studio art from University of Southern Indiana and my Masters of Fine Art in Ceramics from East Carolina University. I currently reside in Nineveh, Indiana with my wife and two kids.